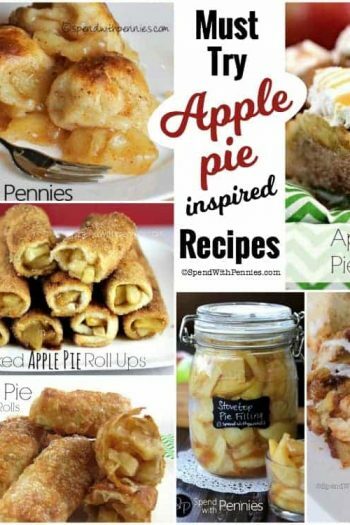 Apple Cheesecake Pie is a fun twist on two all time favorite desserts; cheesecake and apple pie! 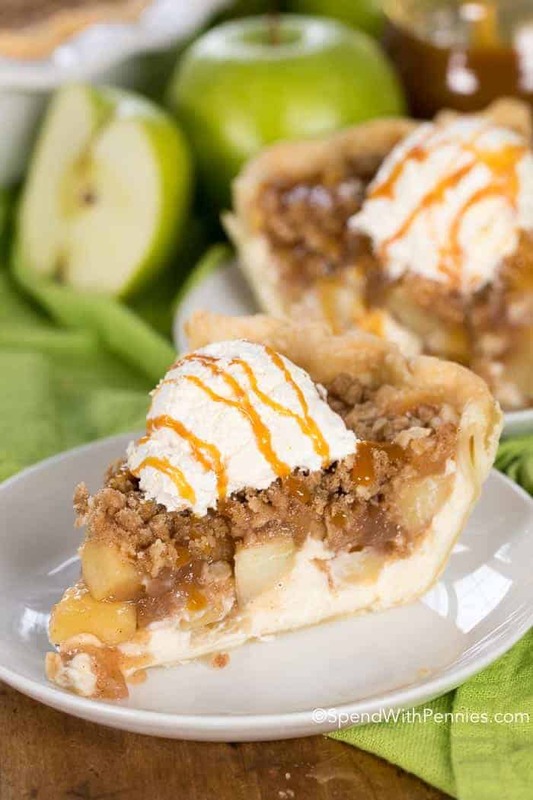 Layers of creamy cheesecake and sweet cinnamon apple pie filling are topped with a crunchy oat topping to make this a flavour and texture explosion in every bite! 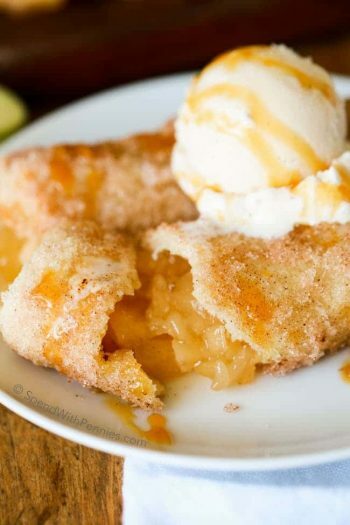 Who doesn’t love apple pie?! 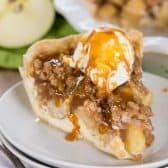 Apple pie with a crumb topping (as opposed to a pastry topping) is my favorite way to enjoy it, it’s almost like an apple crisp in an amazing pastry crust! And of course cheesecake is a given favorite. So often you will see a simple New York cheesecake topped with berries or perhaps converted into something chocolate, caramel or nut inspired. Rarely, if ever, do you get an apple cheesecake – until now. 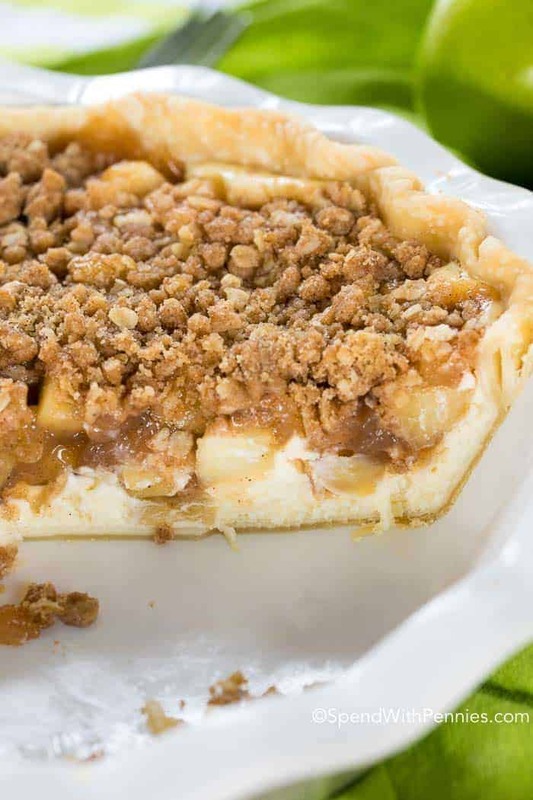 Three luscious layers; cheesecake, apple pie and oat crumb topping are so fantastic together, you will wonder why it is not more commonly served! I have to admit, I cannot take credit for this amazing-ness! 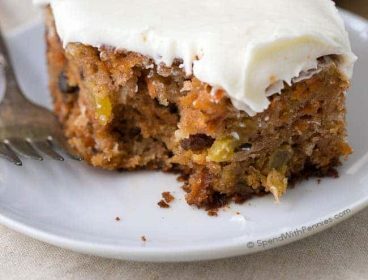 My friend Jocelyn blogs over at Inside BruCrew Life and makes some of the best desserts you’ll find online! I was so excited I to hear she was coming out with a new cookbook…. and I am just as excited to share it with you! 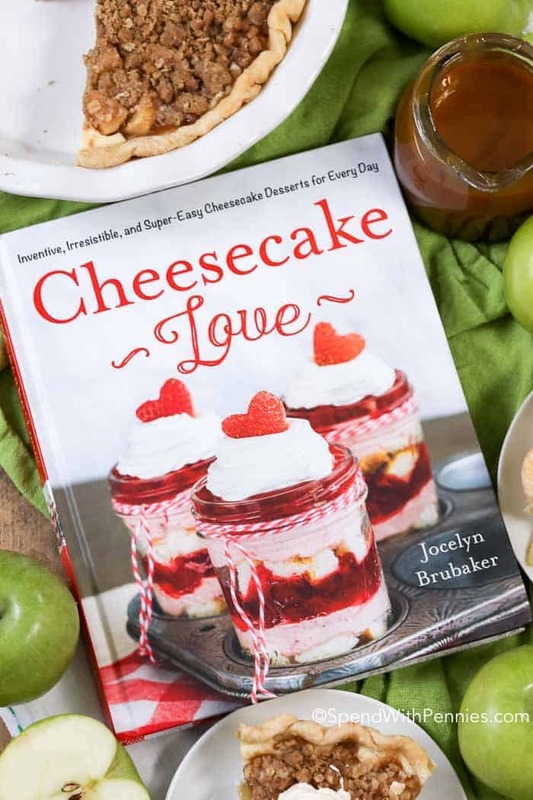 Her cookbook, Cheesecake Love, is an amazing compilation of (you guessed it) cheesecake recipes that are tried, true and delicious! 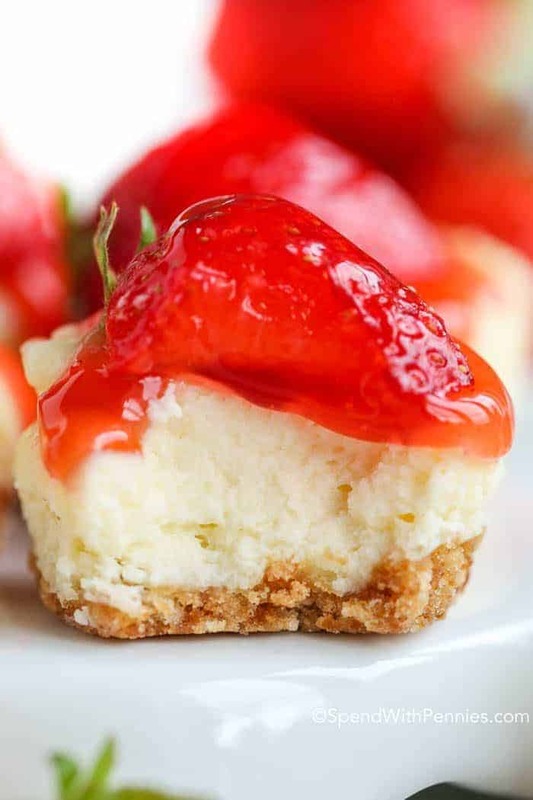 All of the best from cheesecake muffins and no bake cheesecakes to classic and rich cheesecakes! Grab your copy of Cheesecake Love here! 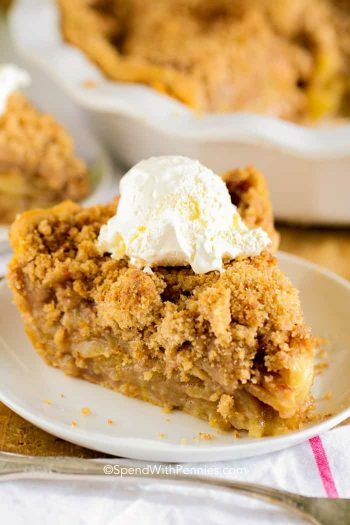 This Apple Cheesecake is absolutely perfect nestled in a pie crust and topped with a crumb topping. While it does contain a few steps, I guarantee you that the effort is worth it! 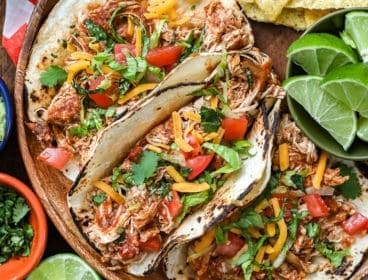 The key to any recipe is planning and preparation; assembling your ingredients ahead of time and completing each step beforehand saves both time and energy! 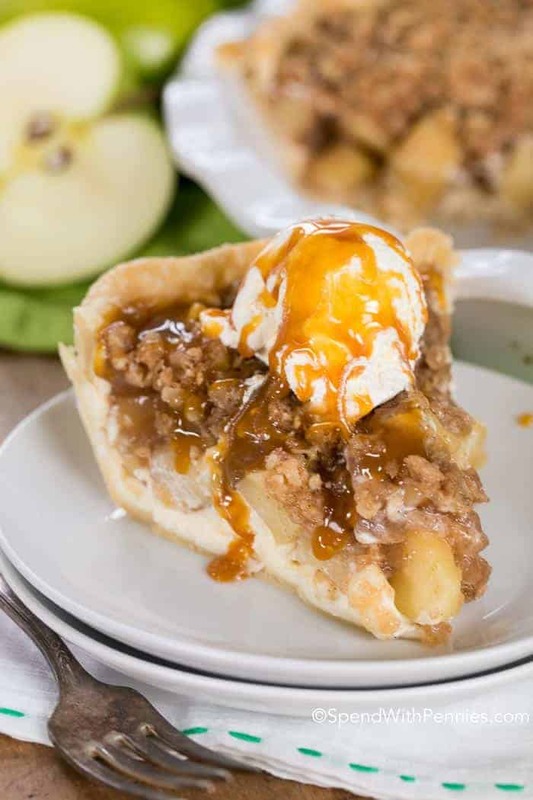 When it comes time to put this apple cheesecake pie together, everything is ready and waiting. 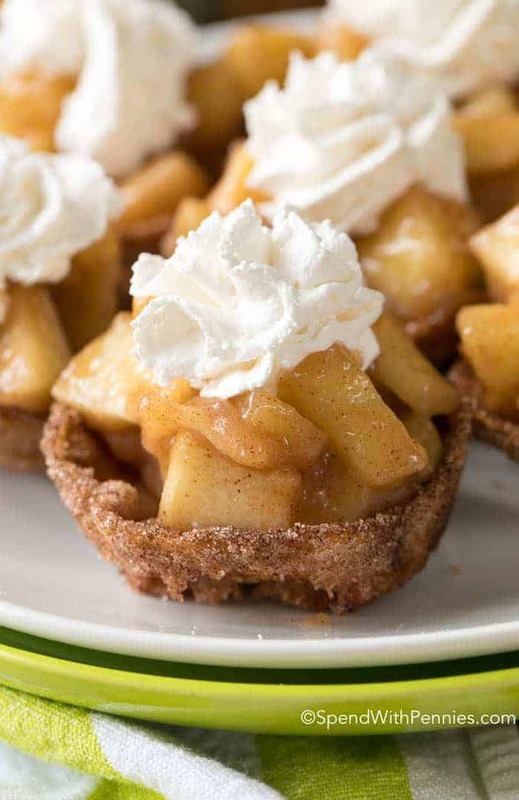 Since I make SO many apple desserts, I have a couple of apple tips to share with you! Apples tend to brown quickly. Add a little bit of lemon juice to the apples in order to stop them from browning. 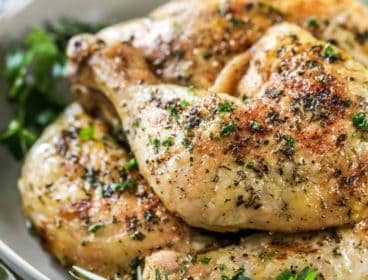 This won’t change the flavor of your dish and will keep them perfectly colored! 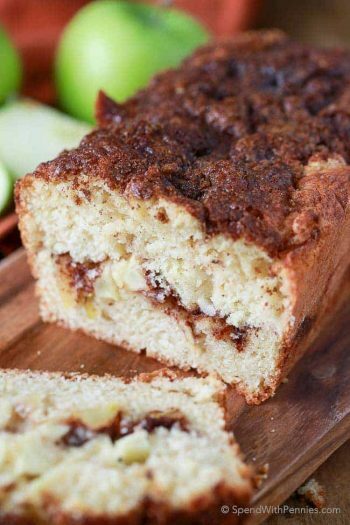 Using a firm apple (such as granny smith) helps it to hold it’s shape and not get mushy. Of course this can vary depending on size, but each apple will result in about 3/4 cup chopped apples. (Grab a couple of extras just in case). 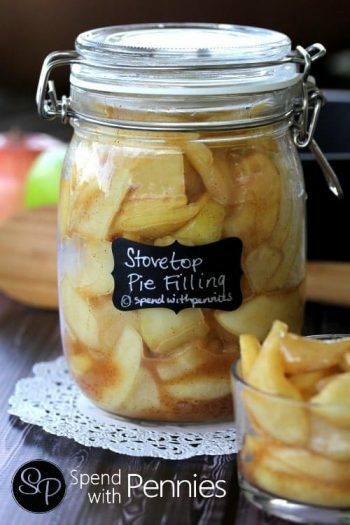 Apples should almost always be peeled before baking as the skins can become tough. 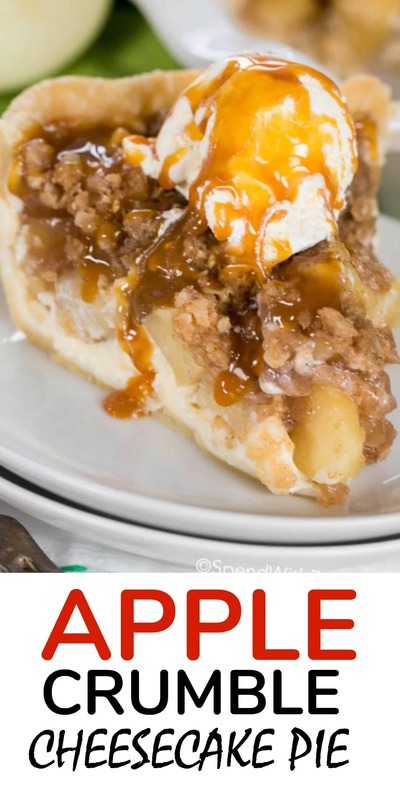 Why choose between apple pie and cheesecake when you can have both with this Apple Cheesecake Pie! To really take it to the next level, top it with a scoop of ice cream and some Easy Caramel Sauce. Drizzle the lemon juice over the apples and toss to coat. Set aside. Stir together the sugars, cornstarch, cinnamon, nutmeg and salt in a large saucepan. Whisk in the water until everything has dissolved. Bring the mixture to a boil over medium-high heat. 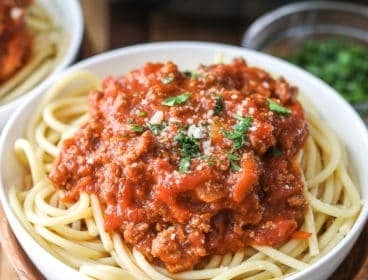 Reduce the heat slightly and simmer for 2 minutes. Add the apples and increase the heat to medium-high heat to bring the mixture to a full boil again. 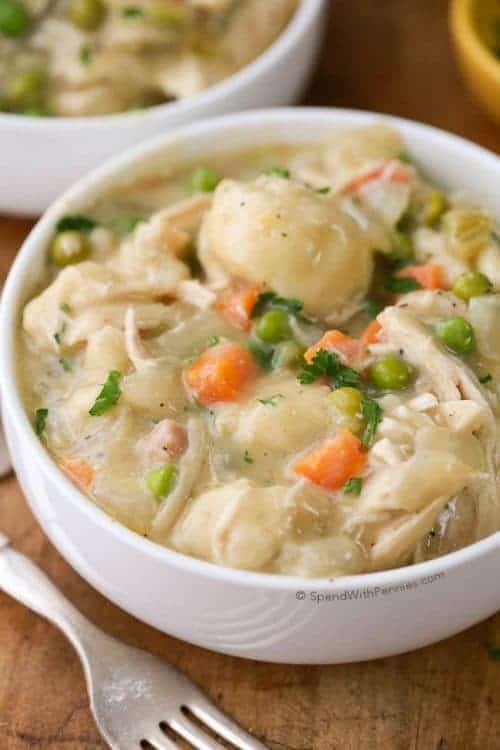 Reduce the heat to low heat and simmer, stirring occasionally for 10-12 minutes. Remove the pan from the heat and let the mixture cool. 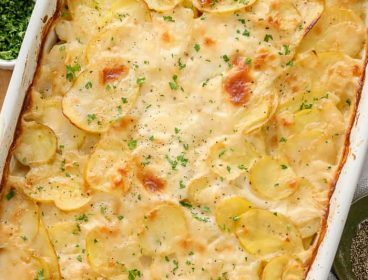 Refrigerate the filling in an airtight container for 4-6 hours to thicken. 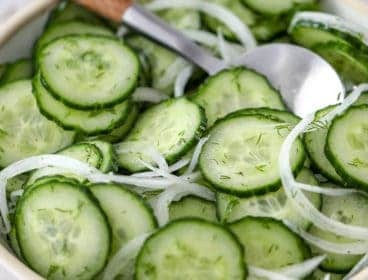 Store in the refrigerator for up to 2 weeks. Spray a 9 inch pie plate with nonstick baking spray. 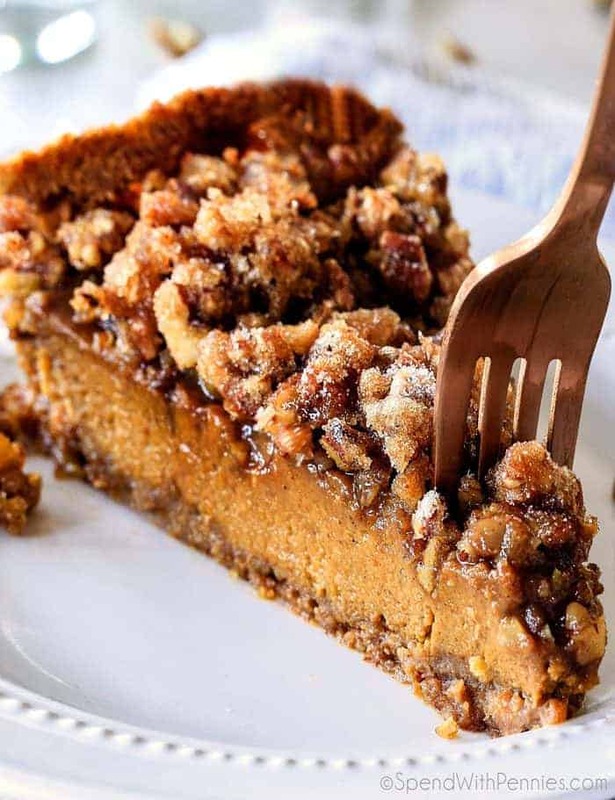 Place the dough in the pie plate. 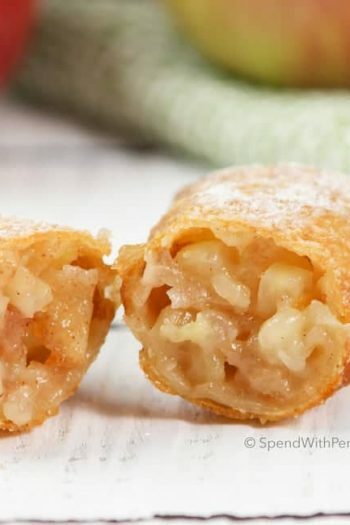 Fold the edges of the dough under and crimp them. Refrigerate until ready to use. Mix together all crumb topping ingredients and set aside. Beat the cream cheese until creamy. Add the granulated sugar and beat the mixture until smooth. Add the egg and beat until fully incorporated. Do not over beat the batter. Spread the cheesecake batter in the prepared pie crust. Gently spoon the apple pie filling on top of the cheesecake batter.